The holiday plant sale will include a wide selection of succulent gardens and several varieties of coleus in holiday colors of deep reds and greens. 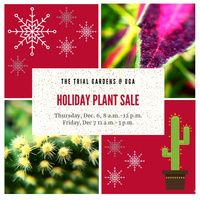 The succulent gardens will be $15, and the coleus will be $5. Cash or check only. Temporary parking is available anywhere in the alley between the pharmacy school and the greenhouses.